Please note sizes for this costume are adult sizes, the style is called TEEN due to the modest covered midriff. 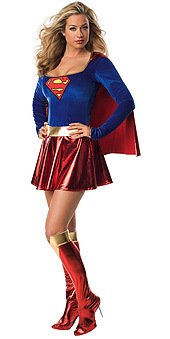 Fight off crime and fly in style while you're wearing this Supergirl Teen Costume. With a blue velvet top and shiny red skirt and cape and matching boot tops with golden trim on the top, this Supergirl Costume is going to be the costume that all your friends are jealous of.